pulse and Sinularia. Everything is doing well except the BTA. since. She is getting smaller and eating less each day. We try to feed her krill and shrimp but she isn't really interested. Now she has moved about a half inch closer to the light and will react a small amount when the lights are on. nitrites 0, ammonia 0, ph 8.4, temp 76.2. Is there anything I can do for her? 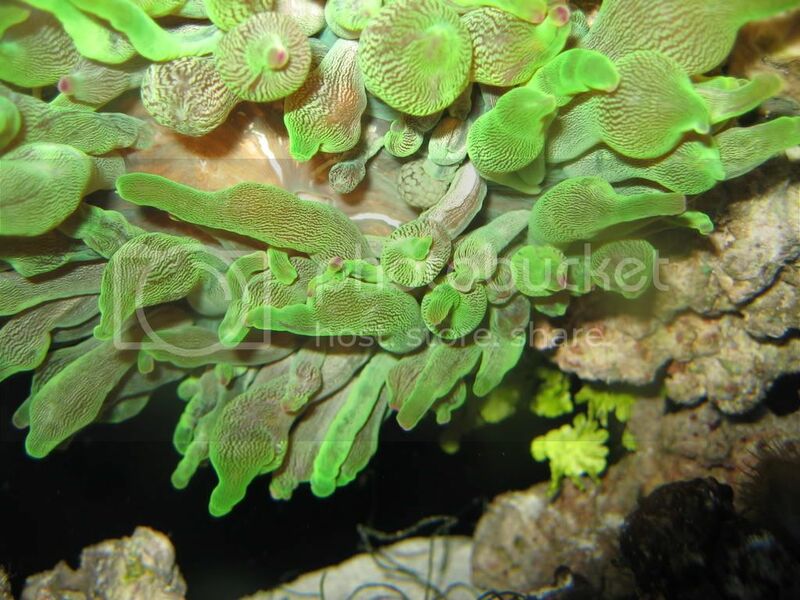 Our green bubble tip anemone has taken a seemingly fast downward turn. the last couple of days he has been 'pooping,' with his mouth open and brown stuff coming out. 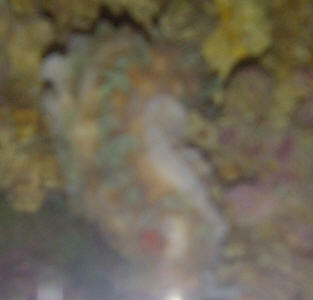 We felt that he has just been eating small amounts of whatever he could catch in the tank. Last night and today, all of his tentacles are mostly retracted and his mouth is open. He is very small right now and is practically upside down. Also, there are white 'stringy' bits waving around in the water flow -- this are mostly from his digestive system, but cannot tell for sure that that is the case fro all of them. He is however still holding on to the rock, and I do see brown excrement near his mouth. I am concerned for him, but need some advice on weather <stormy inside> he is just unhappy at the moment or needs to be removed. I don't want to remove him, if he has a chance to be okay, but certainly don't want to poison my other livestock. Sigh. Unfortunately, I do not have a suitable quarantine for invertebrates at the moment. I do have a bucket of saltwater and power head standing by though. 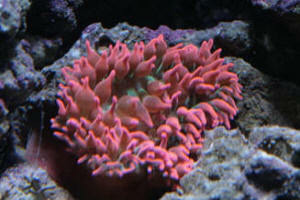 I have been looking through your anemone information but I am not finding exactly what I am looking for. 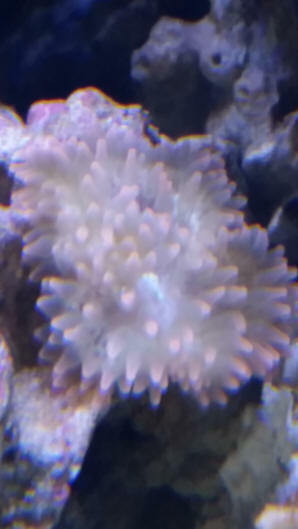 I picked up what was labeled as a Bubble Tip Anemone, it was very healthy looking, had a good foot hold in the sand in my LFS, all they have is sand, but I read that BTA like rock. 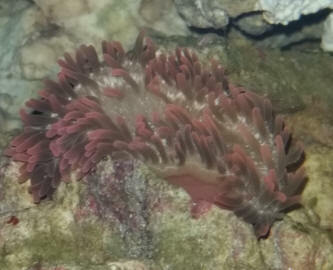 (I had been watching this particular anemone for about 3 weeks before I bought it) I tossed him <in> the tank (not literally) and he moved down under a rocky ledge and seemed fine. Later that night he purged himself like I figured he/she/it would since it went from one system to another. This is my question/concern. It has not come back out of the rock work to sit facing disk up. 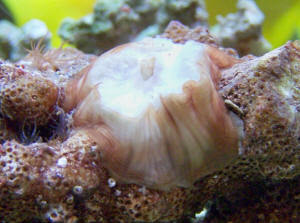 I have been peeking through the rock from the side of my tank and I noticed that it is fully opened,(not stretched as if it were trying to get more light) mouth closed tightly, tentacles are all inflated, really good solid foot hold and from the look of it it looks really healthy but it is vertical not horizontal. but she also loves my pistol shrimp/goby combo so much that the shrimp doesn't even see her as a threat anymore, he just does what he does while she hovers above the burrow rubbing on the goby who also does not seem bothered... strangest thing I've ever seen lol) All of my parameters are perfect, salinity is a little high, 1.025. 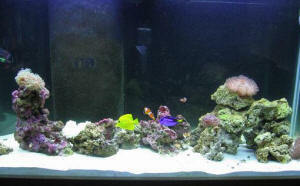 The anemone is 9-12 inches from the light and I have 145 watts of PWC lighting <PC?> ( 2 separate lighting systems that equal 145) which is stronger that the T5's the LFS has on their 55gal tank. (I asked) I have always seen anemones disk up which makes sense due to their lighting needs but mine seems perfectly happy to be vertical instead of horizontal. 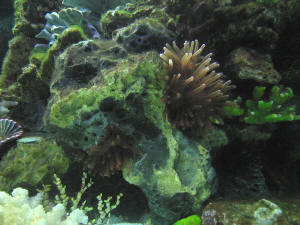 <?> About 1/3 to 1/2 of the anemone is out of the rock getting direct light. Is that normal anemone behavior? I know they tend to just do what they want to and will find their comfort zone/s but I just assumed that it would be visible if it was healthy also, it is not very sticky to the touch which I did not notice until it opened up in my tank of course but I target fed it a few Mysis on phytoplankton and it stuck to the tentacles well. Is this a bad sign? I think I have covered everything...don't want to write an essay lol. 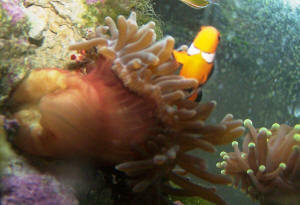 <Give the anemone a little more time to "settle in". I also would not feed until such time. Have you read here and linked files above? Troubled bubble tip- Bubble Tipped Anemone Lacking Light 4/29/08 Hi Crew, <Yunachin here.> Hopefully you can give me some promising information. 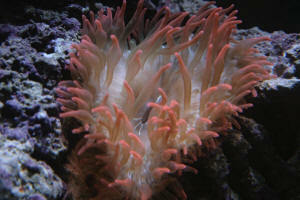 I have a small bubble tip anemone that has been happy in my tank for a little over a year. This past week, the ballast in my light went out and I only have 36 watts on my tank until the replacement gets here on Friday. In the past few days, it has begun to detach itself from the rock and that seems a little worrisome. Would this be in regards to the lack of light? <Yes. Anemones will position themselves to get the best light or avoid too much light.> I will have the new ballast and 72 watts back on by Friday, but I wasn't sure if this is the problem, or something else. I have attached a picture that shows the foot detachment from the rock. It seems healthy otherwise, but if there is something I can do to prevent any further stress, then I wanted to get ahead of the game. <Everything looks good. I am sure when you replace the light that everything will be back to normal. 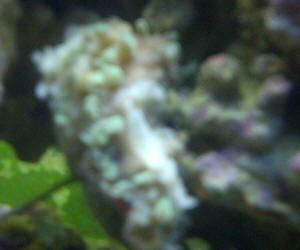 It may move a bit but it looks healthy otherwise.> Thanks in advance for all the help!! Thanks!!! !